Over the last couple of years, Birmingham based band The Toy Hearts have developed excellent relations with Nashville based duo Jeff Burke and Vida Wakeman. As an appreciation for regularly hosting them in Music City, the perfect opportunity for an act of reciprocal kindness was presented when the duo announced a short tour of the UK and Ireland. So with the assistance of a support slot as well as summoning up a reasonably sized audience, the act known simply as Jeff and Vida was given a warm second city welcome and the opportunity to thoroughly entertain those present in the upstairs music room of the Hare and Hounds pub in the Birmingham suburb of Kings Heath. The appetizer of what developed into a three section evening saw The Toy Hearts, operating as a four piece band minus a fiddle player, deliver an half hour support set that consisted of a spectrum of songs covering their busy career to date. With a higher profile Birmingham date upcoming, the band decided to steer clear of their recently released album WHISKEY, playing only the song ‘Pass the Jack’ from this record. Their current project pays homage to the country sub-genre of western swing so they decided to mainly draw songs from their bluegrass catalogue which was more in line with the style of Jeff and Vida’s music. Old favourites ‘Carolina’, ‘When I Cut Loose’ and ‘The Captain’ were amongst the handful of songs aired with an often repeated thought about the latter, that this quality song has the potential to be cut by an ‘A’ list artist one day. Once striding onto the stage after a short interval, Jeff and Vida didn’t take long to win over the crowd, a handful who had seen them live at a nearby venue a couple of years ago. 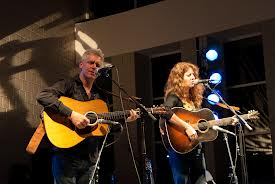 There are very little complexities surrounding the stage show of this couple who don’t shy away from the influence of their New Orleans past even though they now reside in the more practical city of Nashville, Tennessee for country/bluegrass artists. Vida Wakeman handles most of the song writing, makes the more prominent vocal contribution and confines her pickin’ to an acoustic guitar. Jeff Burke on the other hand is a far more versatile picker constantly switching from mandolin to acoustic guitar and making occasional but memorable vocal appearance such as the Jimmy Rodgers style yodelling in ‘Come Back Home To You’. He also demonstrated a passion for old time music with a version of the Delmore Brothers ‘Pan American Boogie’. Jeff and Vida haven’t been prolific album releasers over the last few years with their latest one being the 2009 SELMA CHALK and on this Birmingham appearance Vida delivered fine vocal performances of ‘Heartache Train’, ‘Sharp as a Knife’ and ‘Sugarcane Blues’, all tracks found on this excellent record. 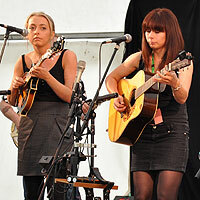 The duo are also keen to pay respect to the giants of bluegrass and played a two-tune medley of Bill Monroe’s ‘Gold rush’ and ‘Big Mon’, a couple of songs into their set. As you would expect from artists in this genre, the stories accompanying the songs were not in short supply as we were given the background to the inspirations and sources of such songs as ‘Oh Fire’ and the set closer ‘Road to Abilene’. Probably the strongest song of the evening saw Vida put on her ‘straight down the middle good ole country hat’ and use her southern drawl perfectly to deliver a number that is thought to be titled ‘Someone Else Is Always Loving You’ – a well crafted and delivered song anyway. ﻿﻿﻿﻿﻿﻿As we were promised at the interval, The Toy Hearts returned to the stage for the finale as they orchestrated a bluegrass jam with their American guests. The two acts interchanged lead and vocal duties on a number of well respected covers such as bluegrass standard ‘I’ll Stay Around’, Gillian Welch’s ‘Miner’s Refrain’ and Ernest Tubbs ‘Drivin’ Nails in My Coffin’. The mutual respect and shared love for this type of music was very much in evidence and the glow of enthusiasm from the stage radiated through the audience. The collaboration between Jeff and Vida and The Toy Hearts seems set to continue in the future and there is optimism that a platform in Birmingham, UK may be shared again.